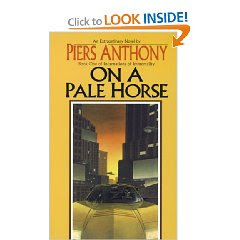 On a Pale Horse ( Book one of Incarnations of Immortality) by Piers Anthony. I first read this series back when it was published in 1986. It definitely had stood the test of time and is just as entertaining and interesting as it was then. Zane mistakenly kills the incarnation of Death and must take over his role. 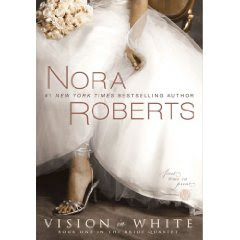 Visions in White is book 1 in a new series The Bride Quartet by Nora Roberts. The series is about childhood friends Parker, Emma, Laurel and Mackenzie, The founder of Vows, one of Connecticuts premier wedding planning companies. Book 1 is all about Mackenzie. Vintage Roberts. The Lightning Thief (Percy Jackson and the Olympians # 1) by Rick Riordan. First time author read of young adult book about Percy who discovers his father is the Greek God Poisedon. Poisedon supposedly stole Zeus's lightning bolt and Percy must go on a mission to return the bolt or the wrath of the Gods will fall upon mankind. Entertaining read for young adults. 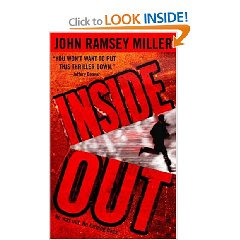 Inside Out by John Ramsey Miller. First time author read of suspense thriller and very well done. U.S. Marshall Winter Massey is hired to protect a contract killer (and his wife) who is a federal witness against mob boss Sam Manelli. The bodies pile up and there is a mole in the department. A killer is on the loose, the wife knows something and is on the run and someone is trying to take out Winter. Very thrilling story and well worth the read. Look forward to reading "Side by Side" next. 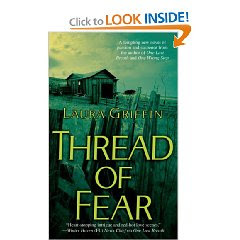 Thread of Fear by Laura Griffin -- book 3 in the Glass Sister's Series. Romantic suspense novel about Fiona Glass who is a forensic Artist who no longer likes her job. She is the best in the business and in high demand. She becomes involved in Jack Bowman's case and he fights to keep her out of it before she gets hurt. Great ending to series. 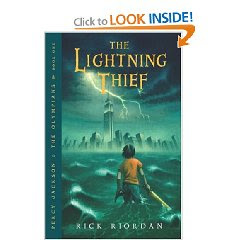 I am reading The Lightning Thief now. Very good book! Have a great day!